I’m going to start off with a confession here. Technically, I didn’t make these; Angela did. But I assisted so I think I can claim the right to post it on here (she declined the invitation to write it up). To me, English muffins are best represented by the Thomas’s commercial and the recitation about “nooks and crannies.” They’re not about the flavor, merely the texture. And, really, the only time people eat them is in Egg McMuffins or (much more rarely) in Eggs Benedict. So why make them at home as opposed to buying them at the store? At the time, it actually seemed significantly easier to make them at home because it didn’t require a trip to the store. My laziness can be quite odd at times. And, you know what, these are pretty easy to make as long as you have the time to do so. The electric mixer does all the work and all you have to do is measure. So, the real question, are these better than store bought? By far. Where the store bought English muffins are all about the texture, these are all about the flavor. Letting the yeast raise over an appropriate time via the starter allows real flavor to develop. They made me actually like English muffins. I did turn the first batch into Eggs Benedict (actually my first time poaching an egg or making hollandaise sauce) but we ate it too quickly to take any photographs. 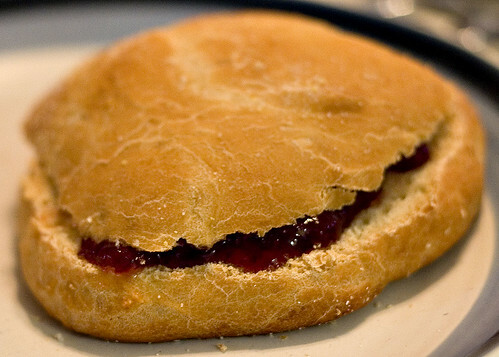 The next day, I did find out the true purpose of these English Muffins: spread some strawberry jelly onto them and they become almost heavenly. The flavor of the muffin perfectly compliments the jelly. I’m getting hungry just thinking about it. These are probably the most misshapen English muffins you’ve ever seen. Apparently, there’s a device called an English muffin ring that can be used to make them round. Like many similar specialized equipment, I don’t have any so I ended up with oblong English muffins. The truth is, they taste just as good without being round and I have proof they didn’t come off an assembly line. Mix together the starter ingredients in a bowl. Cover and leave at room temperature for 24 hours. In an electric mixer, combine the starter and the dough ingredients. Beat well for 5 to 8 minutes. Cover the dough and allow to rise until doubled, about 1 hour. Drop the batter by 1/4 cup full onto a greased cookie sheet. Sprinkle lightly with corn meal. Cover and allow to rise for 1 hour. Bake the muffins for 25 minutes, until lightly browned. Allow to cool and then cut in half. Toast if desired. Makes 10 to 12 muffins.